The floods, which affected 28 of Iran’s 31 provinces, began during the Nowruz Persian New Year celebrations March 21. The first wave of flash floods hit northeastern Iran on March 19, followed by a second wave in western and southwestern Iran on March 25. State media said at least 44 people have been killed. Scattered reports, however, indicate at least 200 people have died. 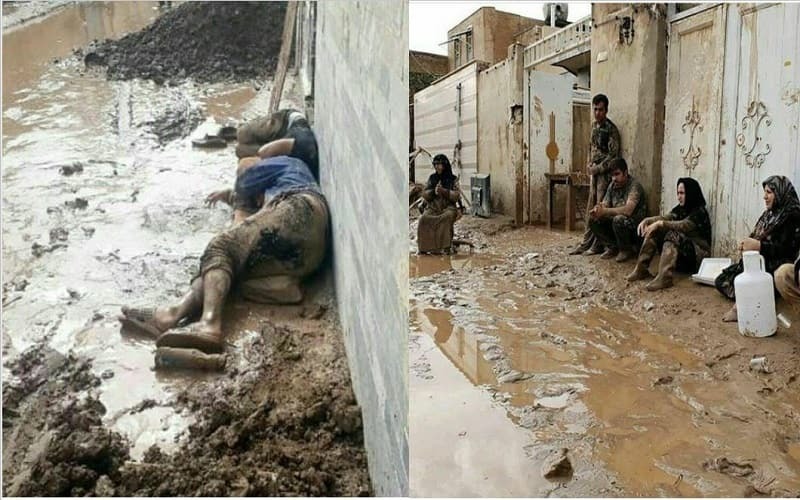 According to an internal police report, at least 90 people were killed third wave of flash floods on Monday, April 1, engulfed the western city of Poldokhtar in Lorestan province. The government aid was too little and too slow. Before sending aid workers, the regime dispatched the Revolutionary Guard Corps (IRGC) and the paramilitary Bassij to prevent any outbreak of protests. Interior Ministry officials have threatened to arrest and punish those who spread the news in social media in a bid to prevent further leaking of reports indicating the actual scale of damages. Many social media users observed that residents, often themselves victims of the floods, rushed to help others, while the authorities did very little, or nothing. In Shiraz, home owners, mechanics, restaurant owners, and other businesses offered free services to the thousands of stranded tourists who had come to the city for the New Year’s festivities. The Iranian government, for years, has been destroying the environment through its destructive policies. Authorities have been over-constructing for a long time and it has destroyed the natural flood barriers that were in place. There were 15 executions of which one was carried out in public. These executions were carried out after Ebrahim Raisi, one of the men in charge of the mass executions in 1988 massacre, was recently appointed as the head of Iran’s judiciary by the regime’s supreme leader Ali Khamenei. During his speech at the inauguration ceremony, Raisi emphasized on the course of massacre, execution, and suppression to safeguard the regime in the past 40 years. He said that he would consider Khamenei’s recent “second phase” statement as his covenant and that the regime’s security is his absolute priority and that justice is subsidiary compared to it. Reports indicate that in March 2019, mistreatment and torture of prisoners and human rights activists continued in Iran prisons. Three activists including permeant human rights lawyer Nasrin Sotoudeh, labour activist Jafar Azimzadeh and Mostafa Motowri were sentenced to flogging. 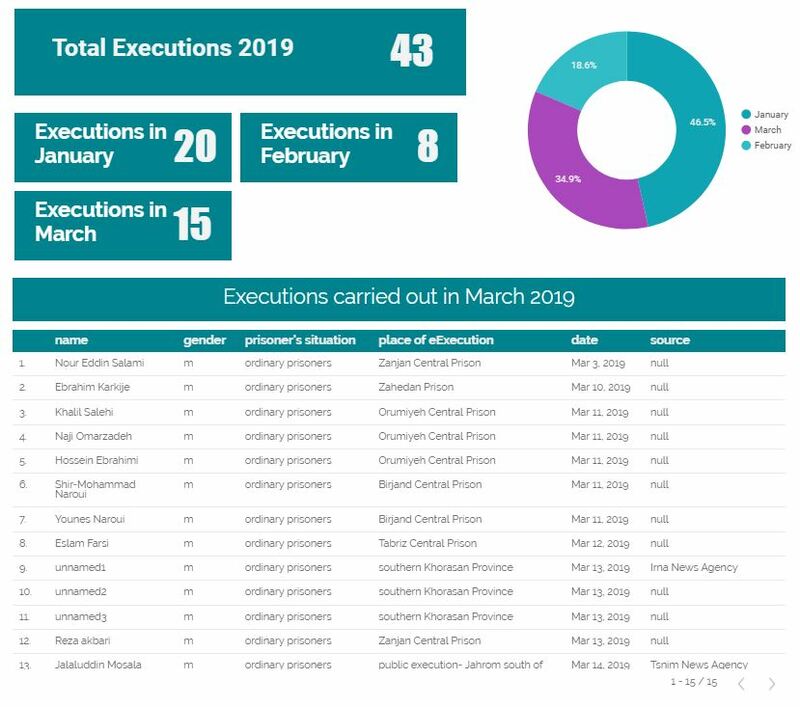 On March 11, 2019, Nasrin Sotoudeh’s husband informed the public through his Facebook account that another 34 years and 148 lashes have been issued for her. The charges levelled against her are solely because of her peaceful human rights work, including her defense of women protesting the compulsory veil, and her outspoken opposition to the death penalty. Prison authorities have intensified pressure on political prisoners in Raja’i Shahr and Urmia Central prison by depriving them of medical treatment. International laws on treatment of prisoners state that those who require specialized treatment or surgery not available in detention facilities should be transferred to appropriate institutions or civilian hospitals. Iran’s own prison regulations stipulate similar standards. Unfortunately, Iranian authorities routinely ignore these rights protections that ensure medical care for prisoners. Despite suffering kidney disease, political prisoner Ali Badrkhani, held at Urmia Central Prison, has been denied access to medical treatment outside the prison. The political prisoner has been locked up with ordinary criminals which violates the principle of separation of prisoner categories. The warden of Raja’i Shahr Prison, has refused to authorize hospital transfers for ill political prisoner Abolghasem Fouladvand despite suffering from heart failure. The care he needs is not available in prison and medical advice recommends his transfer to Tehran Heart Center for treatment. Arsham Rezaei was arrested along with two other men on January 7, 2019, by agents of the Islamic Revolutionary Guard Corps’ Intelligence Organization in Tehran and taken to Evin Prison. Two members of Iran’s Baha’i religious minority, were arrested in March 2019. Saeed Nasseri was arrested on March 21, when he went to Evin prison’s prosecutor office to follow up on the situation of his brother who was arrested just days before and his wife who was arrested 40 days ago. The Iranian Judiciary sentenced 23 prisoners who belong to the Sufi Dervish order to hefty prison terms and lashes. The dervishes have been sentenced to overall 190 years of prison, 46 years of exile, 1,776 lashes, a 46 year travel ban and a 46 year ban on involvement in social and political activities. The dervishes refused to go to court to hear their sentences in protest to the “illegal house arrest” of their religious leader, and not receiving due process. They also said that the believed that the courts were “inquisition style”. In March 2019, at least eight Ahwazi Arabs and 24 Kurdish people were arrested by the state security forces. The Iranian regime has always repressed and discriminated against ethnic minorities under various pretexts.